Politicians in social networks, civil society in politics, geopolitical preferences of Belarusians and the state of small business were, among other topics, in the focus of Belarusian analysts over the last few weeks. Belarusian Politicians Have Nothing to Catch in Social Networks? – Naviny.by analyses what Belarusian politicians do in social networks and blogs: reveal personal secrets or promote their parties and movements. Most of the politicians use Facebook, broadcasting the same messages for Twitter and "VKontakte", as a form of communication with the people. However, so far there are not many politicians in the networks: during the parliamentary elections of 2012 only about 6% of the registered 364 candidates to the House of Representatives used the capabilities of the new media, mainly the opposition and independent candidates. The Return of Europe – BISS presents the seventh issue of the polling memorandum series based on the public opinion poll data of the Independent Institute for Social, Economic and Political Studies (IISEPS). Surprising good news for Europe: for the first time since June 2011 Belarusians would prefer a European choice. No winner appeared in the opposition’s controversy whether to boycott parliamentary elections or to participate. BISS considers those to be the two main outcomes of the latest polling data provided by IISEPS. Belarus’ Foreign Policy Index №10 – Kremlin retains the full political support of Minsk. Ukrainian vector after summer activation returned to zero The relations with developing countries improved a bit, especially with China. The relations with the European Union re-entered the stage of "vacuum of events". These are the main conclusions presented by BISS in the latest issue of Belarusian Foreign Policy Index, covering September and October of 2012. Mikita Likhavid: People Need a "Fairy Tale" about "Iron Man" – a former political prisoner, Mikita Likhavid, during the “Belsat” program, answers the questions, why he does not try to make a political career in opposition, and how to raise the topic of political prisoners to achieve results. In particular, Likhavid notes that above all the opposition should become systematic and strong; otherwise all talks about political prisoners remain speculation. Belarus Leader Relishes Reputation as Dictator – Alexander Lukashenka gave an interview to Reuters, an international news agency (November 26). The journalist shares his observation that Belarusian president is a pariah in the West, viewed suspiciously by Russia and loathed by opponents in exile or jail, but he is relishing his notoriety as Europe's last dictator. The Main Battle will be After Lukashenka – Alexander Klaskovsky refers the Alexander Lukashenka's thesis that it is time "to bring to power normal young politicians." The journalist makes a sad conclusion that the hour "X", which is so expected of change agents can be stupidly missed: "Belarus is lack of truly educated, hardened in a real fight, polished by practice, disciplined by responsibility political cadres. It's difficult to consider as such members of Parliament who do not solve anything, or languishing in the ghetto, the maximum – the leading online internecine wars, opposition figures. Pro-Russian Column in Belarus – historian Victor Yevmenenko fixes the facts that on the basis of some non-governmental Belarusian organisations Russia plans to build a force that involves gaining widespread support among the Belarusians. The author predicts that this force can be transformed into a pro-Russian political movement so he wonders why Belarusian civil society, adhering to national-democratic positions, is passive and indifferent to the mentioned processes. Does Civil Society Need the Political Track? – Naviny.by is trying to understand, whether civil society should follow the path of politicization or continue to do their civil work, despite pressure from the government. Referring to the recent adoption of the concept of the National Platform, the author notes some politicization and warns that "CSOs on the political field, would not be able to fully engage in their activities, also have the risk to narrow the chances of public recognition…and will not be able to fulfill their primary function – to show the people the possibility of self-organization." Evolution of Images of "Enemy" and "Friend" in the Post-war Belarus and Ukraine, 1945 -1953 – the research shows that people born in the 1920-30, call Stalin a friend of the people, and in today's Belarus this place is taken by Alexander Lukashenka. Belarusian opposition is called as enemy, following with such epithets as "useless", "zero", "stupid". The study was presented at a round table held by the International Consortium "EuroBelarus" and the Centre for European Transformation in collaboration with the Heinrich Böll Foundation (Germany). 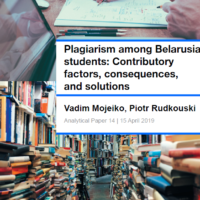 Public Opinion in Belarus on the Project "Modernization for Belarus" – In July and August 2012, the Belarusian Analytical Workshop conducted a qualitative study using a remote method of focus groups. The study summarised the opinions and judgments of different social groups on the socio-economic and political situation in Belarus, the geopolitical orientation of residents, their assessment of the initiative "European Dialogue on Modernization". The main conclusion of the study is that people consider the political leadership of the country as a root cause of poor economic situation and related social problems. News without News – Mediakritika.by presents its monitoring of state and non-state TV channels for the period August-October 2012. The experts note that most of the materials of the state-run TV news programs generally were not news. The only reason for the broadcast was Alexander Lukashenka who’s ideas were supported by video illustrations. The violation of the standard of efficiency was also frequent in the news on the independent TV channel "Belsat". Belarusians' Ideas of Human Rights and Rights Defense Activities – the study was conducted by the Centre for European Transformation on the initiative of Belarusian human rights organisations in April-June 2012. The purpose of the study was to identify concepts that exist in the Belarusian society regarding the relationship between the man and the state, human rights and their defense. The initial hypotheses were generally affirmed that: a) the set of issues that is being researched is not actualized in practices and beliefs of the respondents; b) the level of competence of the respondents as to the specified issues is not very high. Damocles Sword of Anonymous Donations – Yuri Chausov, based on case of the magazine ARCHE which is now under financial investigation, expresses concern that formal suspicion of violating the law in the economic sphere can be a reason for the persecution of civil society institutions. The expert, in particular, draws attention to the legislative nonsense whereby anonymous donations in Belarus are not prohibited, but are treated as foreign aid, the use of which is tightly regulated. State Budget 2013: a Collection of Surprises – Denis Lavnikevich, BEL.BIZ, analyzes the national budget for 2013 and comes to the conclusion that it is more like a set of good intentions. The expert believes that it will be possible to avoid the fiscal crisis in the next year only under two conditions: if Russia continues to supply Belarus with energy on current prices, and if the government finally seriously undertakes the privatization. The expert also cites Andrei Porotnikov, Belarus Security Blog, who points to the fact that next year's budget continues the trend of the last 20 years of chronic under-funding of the national army. Business in Belarus 2012: Status, Trends, Prospects – IPM Research Center prepared an annual report on the status and prospects of small and medium business in Belarus in 2012. The issue considers the economic situation of small and medium enterprises and their development prospects, including analysis of the influence of the integration agreements with Russia and Kazakhstan in this field. On 16 November, Alexander Lukashenka appointed Valer Vakulchyk as Chairman of the KGB. Vakulchyk remains one of the least famous Belarusian security service officials and the Belarusian state leader trusts him a great deal. A week earlier, on 9 November, Lukashenka discharged the previous KGB head, Vadzim Zaitsau, whom he suspected of being complicit in “betrayal of the state’s interests, corruption and nonfeasance”. Recently, the KGB has been in the news in connection with several mysterious events such as the death of KGB Colonel Kazak and dismissal of the head of Military Intelligence, KGB Major General Zakharau. It addition, this summer’s teddy bears stunt seriously damaged the reputation of the KGB and the Belarusian authorities in the face of the whole world. Lukashenka wants to reform the Belarusian KGB. However, he realises that reforms may put him in conflict with those state security officials who will not benefit from the changes. Former KGB head Vadzim Zaitsau lost Lukashenka’s trust. On 19 November, Lukashenka claimed that the reason for his removal was the “moral and psychological atmosphere in some KGB departments”. State Secretary of the Security Council Leanid Maltsau was acting head of KGB for a week. He said that the discharge was related to the suicide of KGB Colonel Alyaksandr Kazak. According to Maltsau, “there still remain a series of other issues that require close investigation”. Maltsau promised that Zaitsau could return to his position if the investigation confirms his innocence. However, Zaitsau will not return, as Lukashenka has serious claims against him. Only the people close to the Belarusian president know the exact nature of the “serious issues” mentioned, but we can hazard several guesses. First, the mysterious death of KGB Colonel Kazak. The Belarusian authorities give the official version as suicide. However, the KGB at first denied Kazak’s death. This looks suspicious and has caused rumours. For example, Kazak could have known about the corruption schemes inside the Belarusian governing elite and some officials could have benefited from his death. Secondly, the uncertainty of the KGB’s actions back in July, when the Swedish PR-company Studio Total organised the so-called “teddy bear landing” in Belarus. The KGB denied an obvious fact for a long time then, and looked at the very least inadequate as a result. Third, Belarusians learned the details of the post-Square 2010 criminal cases. Zaitsau supervised these cases. Several Belarusian politicians, including ex-presidential candidate Ales Michalevic revealed information about torture in the KGB detention centre. Another ex-presidential candidate, Andrei Sannikau, stated that Zaitsau had threatened to inflict damage to the health of Sannikau’s wife and son were he not to act as a witness against himself. Both ex-candidates have since escaped from Belarus and Lukashenka was able to blame the former KGB for this as well. The system of the current Belarusian governing elite remains very non-transparent. The attack on the Lithuanian Embassy in Minsk on 6 November and the blast near the KGB building in Vitsebsk on 11 November could be connected with the crisis in the main state security service of Belarus as well. Belarusian society does not know much about the new KGB boss, and he rarely gives press conferences or interviews. Valer Vakulchyk comes from Brest Region and was born in 1964. The Belarusian media do not even know the exact place of Vakulchyk`s birth. The new KGB boss studied in the Kharkiv guard higher tank command school and the Belarusian Presidential Academy of Administration. He also graduated in advanced courses of counter-espionage of the USSR KGB. Vakulchyk comes from frontier troops. Alexander Lukashenka’s elder son Victar, who is the Presidential Advisor on the national security issues, also served in the frontier troops. Connections between them could facilitate Vakulchyk’s new appointment. The new KGB boss has great organisational skills and preserves absolute loyalty to Lukashenka. Vakulchyk served in the KGB in 1991-2008, and after that Lukashenka appointed him to head newly created structures on several occasions. In 2008, the Belarusian authorities formed the President’s Operative Analytical Centre. Alexander Lukashenka appointed Valer Vakulchyk as a head of the new most secretive state security institution. According to Belarusian Partisan, Victar Lukashenka facilitated this appointment. The main task of the Operative Analytical Centre is control over top government officials. In 2011, the authorities created the Investigatory Committee. 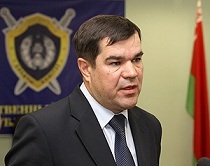 Valer Vakulchyk headed the new structure. He supervised several important criminal cases against bureaucrats who had abused their positions: for example, the case of former Chairman of Polatsk city executive committee Tachyla or Deputy Interior Minister Poludzen. What Will Happen to the KGB? The criminal cases against the nomenclature and control over the top state officials clearly show that Lukashenka relies on Valer Vakulchyk. The new KGB head is neither more democratic nor less democratic than his predecessor. There should be no illusion: a person who works as KGB head follows Lukashenka’s orders and cannot play any political role. On 19 November, Lukashenka said that some people in the KGB want to “feel free and not to go to work, and forget that they have shoulder-straps”. He suggested that they should look for new jobs. Moreover, Belarus hinted that he might reduce the number of KGB officials from 12,000 to 3,000. Where these people will go is not exactly clear. It will be Vakulchyk's task to deal with it. Changes inside the KGB will happen as a follow-up to the reforms of the police and nomenclature. These three columns have been the basis of the authoritarian government for a long time.